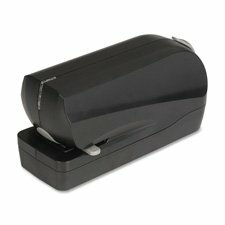 Electric Flat Clinch Stapler uses standard-size staples to fasten up to 20 sheets of 20 lb. paper. Patented jam-free design features overheat protection and low-staple indicator. Simple button releases the staple magazine. Stapler runs on 110 Volts or six AA batteries (sold separately). Power cord is about 6' or 1.8 meter.